SLM Solutions, Novi, MI, proudly played its part helping athletes strive for gold at the Rio Olympics, by providing selective laser-melting metal additive-manufacturing technology to support bicyclists. 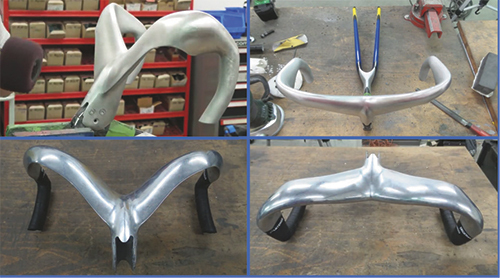 SLM Solutions’ customer Erpro & Sprint, a digital-manufacturing in France, partnered with the French Cycling Federation and designer GIE S2A to develop custom handlebars, produced on an SLM 280HL metal 3D printer, for seven Olympic athletes. The success of the handlebars lies in their innovative designs created by GIE S2A, combining aerospace and automotive processes. Taking advantage of the design possibilities additive manufacturing affords, the handlebars were created to incorporate an interior lattice structure, providing strength yet minimizing weight. Additional weight savings were realized through the lightweight material choice, as the handlebars were printed in aluminum. With reportedly the largest build chamber in its segment, at 280 by 280 by 350 mm, the SLM 280HL offers high throughput with multiple laser configurations and a patented bidirectional powder-recoating process. Open software architecture offers the freedom of controlling system parameters. See also: SLM Solutions NA, Inc.